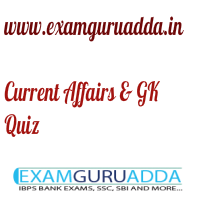 Dear Readers Examguruadda.in presents Current Affairs quiz of 11-12th January 2017 that cover important current affair events. Current Affairs quiz for IBPS PO,clerk, RRB-Po,Clerk, SBI, NIACL,Railways and SSC Exams. 1. The Jigme Dorji National Park is located in which country? 2. The World Hindi Day (WHD) is observed on which date? 3. The 2017 World Economic Forum (WEF) annual meeting will be held in which country? 4. Which country has become the world’s first country to cease FM radio broadcasting? 5. Who has been sworn as the new President of Nicaragua? 7. World's First literature Festival was hedl in which city? 8. Name the second of the Scorpene class submarine that was launched at in Mumbai in January 2017 for sea trials? 9. The book “The Untold Story of Talking Books” has been authored by whom?